Since 1940, The QUIKRETE® Companies have produced more than 200 professional-grade and consumer products which fall into one of four categories: core products, commercial grade products, specialty products and repair products. Through these product lines, The QUIKRETE® Companies offers concrete and mortar mixes, cements, concrete repair products, stucco, waterproofing, tile setting and blacktop products, floor underlayments, sand and aggregates, and other seasonal items. QUIKRETE® concrete is used in building and refurbishing commercial projects all around the United States. QUIKRETE® products have recently been used in diverse projects that include the National Museum of the American Indian (2004 Masonry Construction Project of the Year), the Georgia World Congress Center, the Boston Convention Center, as well as sports venues that include Safeco Field in Seattle, Coors Field in Denver and historic Fenway Park in Boston. PACKAGE PAVEMENT became a licensed QUIKRETE Manufacturer in the early 1980’s. Since then we have provided distribution to the Tri-State region of New York, New Jersey and Connecticut. Click HERE to visit the main Quikrete website. Click HERE to view Spec Sheets for Quikrete. A special blend of fast-setting cements, sand and gravel designed to set hard in approximately 20-40 minutes. Sets posts without mixing. Pour dry mix into hole and soak with water. Special formula which stops leaks in concrete and masonry in just 3-5 minutes. Stronger than concrete. Multi purpose concrete repair material with strong adhesive properties. Trowels to a feather edge of 1/4″. Made of a special blend of vinyl resin, sand and Portland cement. Just add water. Highly water resistant clear coating that protects and seals concrete surfaces. Also promotes proper curing by retaining water in freshly placed concrete. Sealing Concrete from Water, Salt, Grease, Etc. Specially formulated to set in approximately 10 minutes. Specially designed for molding concrete into place. Ideal for curbs, downspouts, steps, and vertical applications. Multi-use product for a variety of decorative and landscaping applications. Also for making concrete mixes. 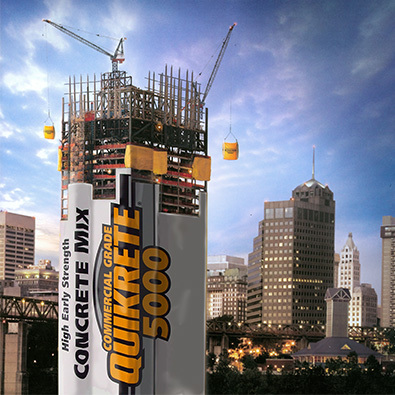 Quikrete’s original high strength blend of Portland cement and graded sand. Excellent for repairing or resurfacing cement surfaces. A blend of masonry cement and graded sand. A long lasting, strong bonding mortar. Just add water an mix to desired consistency. Laying Brick, Block, or Stone for walls, columns, etc. High strength commercial grade blend of sand and cements specially selected for masonry applications. Just add water. Add color with Quikrete® Stucco & Mortar Color.